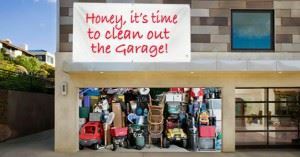 A great weekend project is a garage cleanout! Memorial Day is quickly approaching and many people are getting ready to entertain family and friends. With a little time and energy, you can turn that eyesore of a garage into a clean, organized space. That could mean additional space for entertaining, a place to house your vehicles (again) or additional storage area that doesn’t have to be hidden from guests! The Huffington Post ran a great article this week on tips to organize your garage (you can check out the article by clicking here). 5. Label, sort and put away. This is a great list to help you on your way. At Junk King Palm Beach, we have done many garage cleanouts! When you decide what is on you “go list,” give us a call. You don’t even have to organize everything in one area, just point us to what needs to be taken! Now, start your list! This entry was posted in Junk Removal Palm Beach, Junk removal West Palm Beach, Palm Beach Junk Pickup, Palm Beach Junk Recycling, Palm Beach Junk Removal Prices, Palm Beach Junk Removal Reviews and tagged junk king trash pickup, Palm Beach Garage Clean Out on May 15, 2015 by Dave Archer. Last updated July 31, 2017 .